Heroic achievement in the superior performance of his duties while serving as Mobile Assault Section Leader, Weapons Platoon, Company I, 3d Battalion, 3d Marines, Regimental Combat Team-7, I Marine Expeditionary Force Forward, from March to September 2006, in support of Operation IRAQI FREEDOM. Upon assuming his role as the section leader for the newly formed mobile assault platoon, Sergeant Stroud took on responsibility for 24 Marines, 4 vehicles, 3 crew-served weapons and 3 electronic counter-measure devices. On 25 August 2006, a Marine in his section was injured by enemy small arms fire. Recognizing that his section was being ambushed, Sergeant Stroud quickly moved the injured Marines to the evacuation vehicle and simultaneously directed his Marines to use the crew-serve weapons from the turrets as support by fire positions. 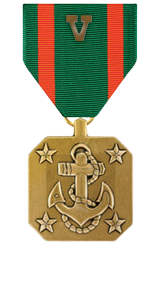 Due to his rapid actions and ability to control the situation, the enemy ceased their fire and fled, enabling the rapid evacuation of the wounded Marine. Sergeant Stroud’s initiative, perseverance and total dedication to duty reflected credit upon him and were in keeping with the highest traditions of the Marine Corps and United States Naval Service.